SOG® FF - 10 Salute Knife. Progressive, performance - driven blade. This all-purpose Knife has a great design and sense of practicality for everywhere from home to work and beyond. 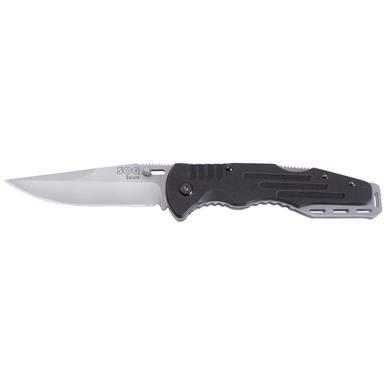 Has a straight, bowie-style steel blade that's attached to machined G10 handles in combination with scalloped full-length steel liners. Attaches on to your pocket or belt with included clip. Measures 8 1/4" long open, blade measures 3 5/8" x 1/8" thick. Weighs 4.2 oz. Pick this Knife up ONLINE today!